Even though we are only still in April, the weather has been kind to us. The sun is beaming down from a lovely blue sky, and the grass is an exuberant shade of green. Long may it continue, particularly as we open once again on Saturday May 18th! 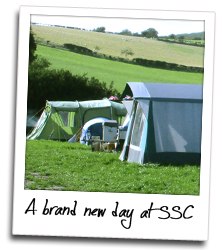 Studland Summer Camp, or "SSC", is a long-established, family-friendly naturist campsite, situated on the Isle of Purbeck in Dorset, which is part of the stunning jurassic coast. Our simple, rustic site is gently sloping and surrounded by miles of breathtaking scenery while still within easy reach of the nearby town of Swanage and the historic village of Corfe. We're certainly not a "glamping" site, but that adds to the charm! ...and all for less than you may think! Please see our rates page for current pricing.